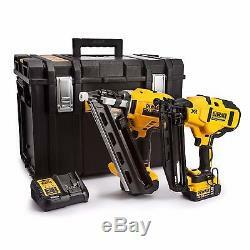 DeWalt DCN660 + DCN692 Framing + Finishing Nailer Kit 18V DCN692 Cordless XR Framing Nailer. Compact, lightweight and ergonomic design that makes the tool easy and comfortable to use, but durable enough for the worksite environment. The depth of drive can be easily adjusted using the handy thumb wheel depth adjuster. The sequential operating mode allows for precision placement and the bump operating mode provides the user with production speed. Increased visibility and durability along with protection for work-surface from the non-mar contact-trip and depths can be easily adjusted using the thumb wheel depth adjuster. Ergonomic tool design allows the nailer to fit easily between a 400mm centre stud. The user can engage the contact trip lock-off and prevent accidental discharge of fastener and dry fire lockout ensures that the tool is protected from firing without nails in the magazine. Mechanical rather than gas operation offers consistent performance at a temperature between -20 to 50°C and minimal cleaning/service requirements. Its cordless design allows you to work without the inconvenience and safety risk of trailing leads. The gas-free operation offers a significant saving in running costs. Latest generation 18V XR Li-Ion Brushless 16Ga nailer offers the cutting edge in nailing technology. BRUSHLESS motor offers runtime that cannot be beaten in a compact package. Compact, lightweight and ergonomic design makes the tool easy and comfortable to use but durable enough for worksite environment. Mechanical rather than gas operation offers low running costs and consistent performance at low temperatures. Sequential mode allows for precision placement and the bump operating mode provides the user with production speed of up to 4 nails per second. Depth of drive can be easily adjusted using the thumb wheel depth adjuster. Tool-free stall/jam clearance minimises downtime. Trigger and contact trip lock-off and prevent accidental discharge of fastener. Nail Diameter - 1.6 (16Ga) mm. Magazine angle - 20 °. Nail Length - 32 - 63 mm. Magazine capacity - 110 Nails. Weight - 2.35 kg. Nailer Operating Mode - Bump and Sequential. Integrated Belt Hook - Yes. Jam Clearing - Tool free. Temperature Range - -20 to 50°C. Noise LPA 1sd / Uncertainty - 81 / 3 dB. Noise LWa 1sd / Uncertainty - 92 / 3 dB. Vibration / Uncertainty - <2.5 / 1.5 m/s2. Two speeds to optimise the nailer for firing all lengths of nails. With brushless motor technology for excellent power and tool-free jam clearance to minimise downtime. Suitable for many applications, including stud wall insulation, roofing, floorboard and cladding installation etc. Longer run time, quicker readiness to fire, less recoil and more durability when firing short nails. The power to fire a 90mm Ring Shank nail in Soft Wood and 63mm into Hard Woods. Mechanical operation offers consistent performance at temperature between -20 and 50 degrees Celsius. Class-leading vibration and sound figures offer fantastic user protection. Versatile 30-34 degree magazine angle will accept most clipped head and off centre round head framing nails. Depths can be easily adjusted using the thumb wheel depth adjuster. 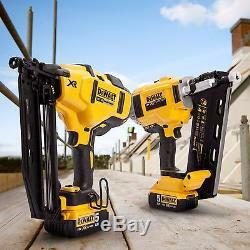 1 x DCN660 2nd Fix Nailer Nail Gun. 1 x DCN692 1st Fix Framing Nailer. 2 x 18v 5.0ah Li-ion Batteries. Nail Diameter: 2.8 - 3.3 mm. Magazine angle: 30 - 34°. Magazine loading: Rear - Load. Nail Length: 50 - 90 mm. Magazine capacity: Up to 55 Nails. Firing mode: Bump & Sequential. Temperature Range: -20 to 50°C. 1 x Multi-Voltage DCB105 XR Universal Charger. Varies the charge rate according to battery type to increase battery pack life. It features diagnostics with a bright LED indicator which communicates the battery charge status: charged, charging, power problem, and battery too hot or too cold. 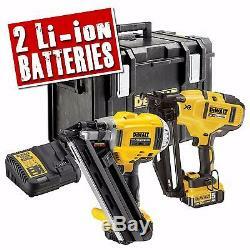 Charges all XR Li-Ion DEWALT Slide Pack 10.8, 14.4, and 18 Volt batteries. Trade Counter Online are an Official DeWalt Distributor. Visit our shop to view the full range of DeWalt. We will always go out of our way to source the product you are looking for. Trade Counter Online is a modern-day builders merchant, supplying top brand products and deals from the builder's trade counter straight to your door. We operate from a 10,000 ft2 warehouse and trade counter in Dundee, Scotland where we stock over 15,000 building products. TCO will deliver direct to you, to your customer or to site. In the case of unforeseen circumstances or beyond reasonable control we may be unable to deliver in this time frame. In such circumstances, we will contact the customer to advise of any delay. Once the order has been dispatched you will receive an update with the courier's details and your consignment number. The item "DeWalt DCN660 + DCN692 Framing + Finishing Nailer Twin Pack Kit Nail Gun" is in sale since Tuesday, October 4, 2016. This item is in the category "Home, Furniture & DIY\DIY Tools & Workshop Equipment\Power Tools\Nail & Staple Guns". The seller is "trade-counter-online" and is located in Dundee.